Farro—a type of hulled wheat—is an ideal complement to salads, soups, and side dishes. Farro benefits, from protein and fiber to zinc and iron, make it worth seeking out. Farro benefits your health as a worthy source of protein, zinc, iron, magnesium, and more. Farro benefits are nothing new: The venerable and nutritious wheat is said to have sustained the Romans as they conquered the world 7,000 years ago. 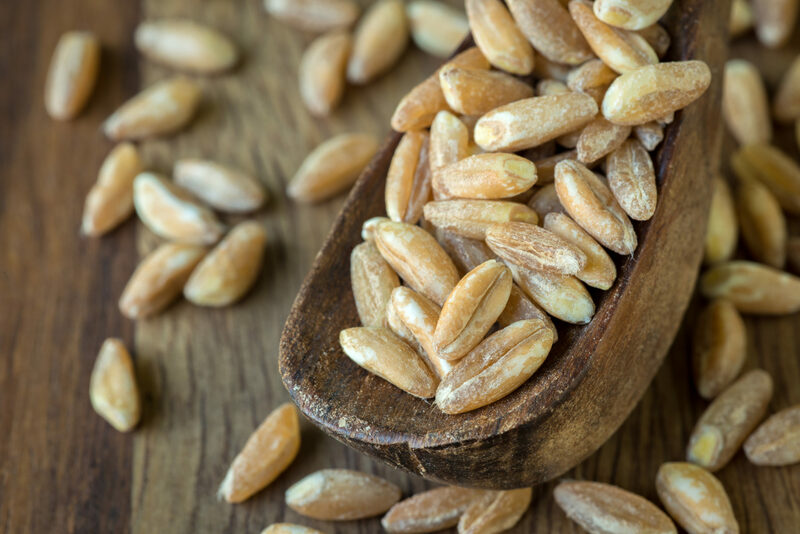 Legend has it that Julius Caesar himself brought farro (triticum dicoccon) to Italy after invading Egypt in 30 B.C. Known as “the Pharoah’s wheat” because it was the only type cultivated in pharaonic times, this high‑energy grain was a staple in Roman society. Farro is the Italian name for this hulled ancient mother grain. Also known as emmer wheat, farro is credited for giving rise to modern wheat. It’s often confused with spelt (triticum spelta), but they’re two distinct—though closely related—grains. Farro can help us feel more full, helping in any efforts to lose weight. It’s shown here as a key ingredient in a creative salad. Farro has a low gluten content with more fragile gluten molecules than those of modern wheat, making it easier to digest, and sometimes tolerable for many gluten-intolerant individuals. An excellent source of whole grains and complex carbohydrates, farro can play a significant role in maintaining healthy body weight, and reducing diabetes, heart disease, and cardiovascular disease risk, as well as helping to prevent certain forms of cancer. Farro is rich in minerals, antioxidants, lignans, phytonutrients, and fiber. Its magnesium content is important in glucose and insulin secretion, which helps fight metabolic syndrome, a strong predictor of type 2 diabetes and cardiovascular disease. New studies have found that betaine, present in whole grains like farro, may work together with choline to prevent chronic- and stress-induced inflammation. Research shows also that farro contains a special type of carbohydrate called cyanogenic glucosides that stimulate the immune system, lower cholesterol, and play a role in blood clotting. 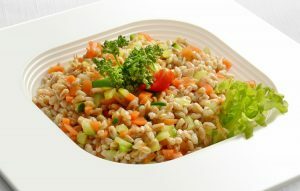 Farro is sold whole, semi-pearled, and pearled (which determines cooking time), and is also available as flour and pasta. The grain looks like plump barley and may be successfully interchanged in recipes calling for spelt, barley, and quinoa, though cooking times will vary. Enjoy farro’s distinctly nutty flavor and al dente bite in soups and stews, as a rice substitute, or in salads. Join the resurgence of this mother grain that has caught the eye of both gourmets and the health-conscious. BEYOND FARRO BENEFITS TO YOUR HEALTH: TASTE! A grain of farro looks and tastes somewhat like a lighter brown rice. It has a complex, nutty taste with undertones of oats and barley. But lacking the heaviness of many whole-wheat grains, farro tastes more elegant than earnest. The ancient Roman legions knew something that modern chefs are only now rediscovering: Farro, a form of wheat that originated in the Middle East’s Fertile Crescent thousands of years ago, offers nutrition enough to march on with a nutty taste and pleasantly chewy texture. As chic restaurants around the country are demonstrating, farro is also versatile enough to substitute for rice and other more familiar grains in dishes ranging from risottos to salads, soups to breakfast bowls. 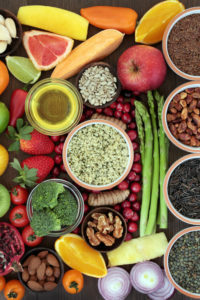 This post is adapted from the 2018 edition of Superfoods, a health report published in conjunction with Environmental Nutrition. Click here for more information about Superfoods. 2 diabetes, add, antioxidants, breakfast, calories, cancer, cardiovascular, cardiovascular disease, cardiovascular disease risk, cholesterol, choline, complete protein, cooking, diabetes, diabetes heart disease, farro benefits, fiber, forms of cancer, glucose, gluten, health, healthy body weight, heart disease, immune system, inflammation, insulin, iron, Lose Weight, lower cholesterol, magnesium, metabolic syndrome, niacin, nutrients, nutrition, phytonutrients, protein, quinoa, report, serving size, stress, type 2 diabetes, whole grains, whole wheat, zinc.